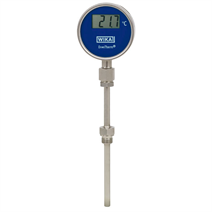 The DiwiTherm® is the ideal combination of a digital display and a resistance thermometer. This compact temperature measuring instrument can be used in a wide range of applications and works without an external power supply. A wide variety of possibilities for the combination of insertion length, neck length, connection to thermowell etc. are available for the thermometers, suitable for any thermowell dimension and the widest range of applications. Operation without thermowell is only recommended in certain applications. Optionally, the DiwiTherm® can be manufactured with a process connection for measuring the temperature on a pipe's surface.